Here’s Nora, in her adorable jungle cat jammies (a gift from Grammy), with the equally ferocious and threatening Leopard Bear. Watch out! She was pretty thankful for it. Over Thanksgiving weekend, we visited the Delaware Children’s Museum in Wilmington. Nora was a little young for some of the displays, but she had a good time pressing buttons, turning wheels and looking at herself in the mirror. 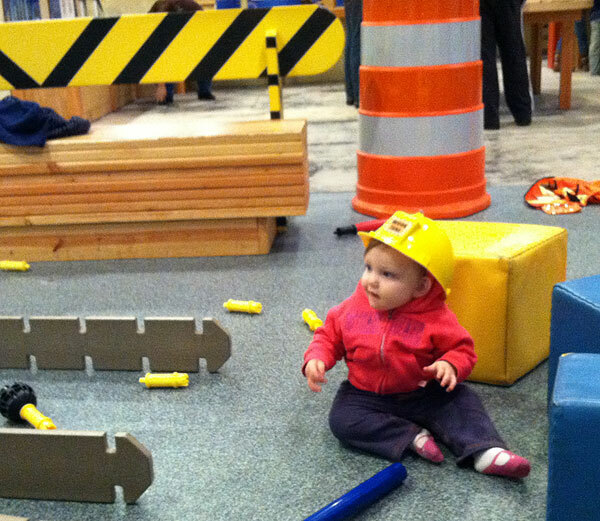 Here’s a picture of Nora, hard at work in her hard hat. She was just about ready for her lunch break. We visited Grammy and Papa this weekend and they have a sweet, lovable, happy-go-lucky, energetic yellow Labrador named Daisy. Daisy is maybe four times Nora’s size, and though she wouldn’t hurt a fly, she has a loud bark, big teeth, and she likes to lick Nora’s face. When Daisy barked, Nora winced. Nora whimpered, and held on to our legs when Daisy was near. As Kevin put it, it must be like going to visit your friends – having a good ol’ time – and then remembering that they have a pet lion. Her reaction was not all about fear though. She was very, very curious about Daisy. She crawled under an armchair, peering at Daisy from her hiding place. She kept one eye on the dog the whole time. 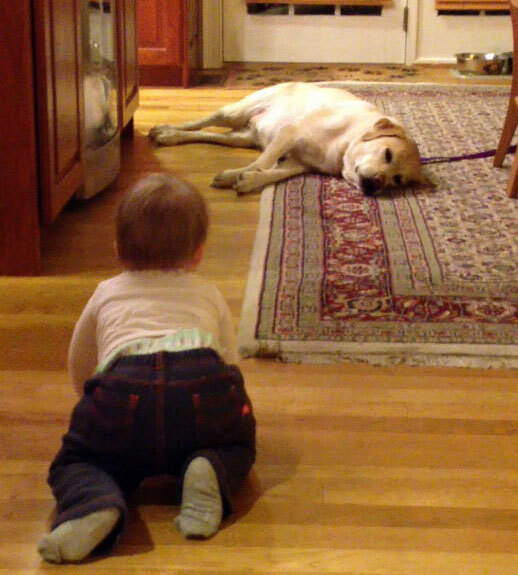 And then, on the last day of our visit, Nora made a bold move: she ventured out into the wild, leaving the safety of the living room to crawl into the kitchen, all by herself, where Daisy lay resting on her side. Nora looked back at us every few seconds, making sure that this was a good idea, but she traversed the wide expanse of the hard wood floor all on her own. She whimpered as she went, letting us know, look, I’m going to do what I have to do, but I’m not saying I like it. But she did it. She made it all the way to the dog. We saw a similar kind of determination once when she decided to buck up and take her vitamin even though she despised it. Every other night, when the little dropper came near, she made a show of it, thrashing around, closing her lips and scrunching up her face. But on this night, she paused and stopped trashing to take a good look at the dropper; she took a deep breath, opened her mouth and pulled it to her mouth. This is a quality I admire: the determination to go forward even if you’re afraid – to do something tough even if you’d rather sit this one out. This will take her far in life. I hope she’ll be able to access this store of motivation when it comes to completing a difficult homework assignment, hitting a baseball after striking out, singing in front of others, standing up to kids who give her a hard time and doing the grunt work in order to achieve whatever goal she sets out for herself. I think it’s important to note that she did look back at us to see our reaction – she wasn’t going to approach the scary monster without our support and reassurance that what she was doing was okay. Sometimes, fear is an appropriate reaction to scary situations, and I wouldn’t want her to do something dangerous (although I do realize that I will not always be able to step in and prevent this from happening. She is going to take risks and test us.) But, we just want to make sure she knows that we’ll always be there to support her as she goes forward, helping her to decipher a good decision from a bad one, guiding her and letting her know that we recognize her efforts. We’re proud of our ten month old girl. Already, we can see the silly, sensitive, smart, curious, courageous little person she’s becoming, and we most certainly love what we see.